You may remember Brenda from our 2012 Annual Report. 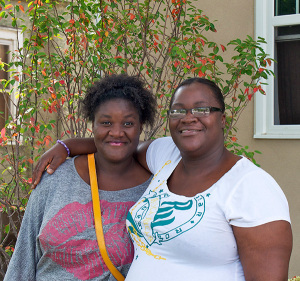 Brenda as well as her husband and their two pre-teens moved into a 3-bedroom Alliance property from a shelter. Today Brenda’s husband is working as a cook and she continues her work at the Mall of America, where she recently received a raise and encouragement to apply for a leadership role during her review. The girls love their own rooms and the whole family appreciates moving off busy Broadway Avenue onto a quieter street. Jontel, also featured in our 2012 Annual Report, will graduate from Culinary Arts School this June. With improved study habits, he is excelling in school receiving A’s and B’s in the most difficult courses. Jontel is now working part-time and has his three children 4 days each week. He is looking forward to graduating from school so he is able to work full-time and save some money. After moving from place to place, Jontel moved into Alliance Housing where he has now had stable housing for the past 3 years, which allows him the freedom to pursue his career and provide for his children.